Growing up, I had a problem with bad breath. The only thing is, I didn’t know it! It’s a touchy subject and not too many people brought it up with me. That is until one day in college when my friend Brennan spoke up—on a regular basis—and said, “Man, your breath is terrible.” Brennan begged me to brush my teeth, chew some gum, or use mouthwash—I did all of that several times a day, but they were only temporary solutions. Needless to say, I was embarrassed. I had chronic bad breath—also known as halitosis or oral malodour. It is estimated that bad breath is an issue for 65% of Americans! No one likes to come down with a case of bad breath. But the truth is that bad breath, or “halitosis” as it is called in medical language, is an extremely common affliction. And, contrary to popular belief, bad breath is not just something that “happens” to a few unfortunate people. There are all sorts of reasons that someone can suffer from halitosis. Some of these reasons are relatively benign and are easy enough to remedy. Other causes of halitosis stem from something quite serious and are much more challenging to treat. Alcohol and tobacco, dehydration, sinus infections, certain foods, and milk intolerance can all contribute to a case of bad breath. It turns out that my bad breath was a symptom of an underlying cause. After careful inspection, I discovered a thick, white coating on my tongue. A bacterium that forms on the tongue is a sign of a chronic fungal infection known as candida, or thrush. According to traditional Chinese medicine, a light and thinly coated white tongue reflects good digestion; however, a thickly coated tongue that is white or yellow if often associated with poor gut function and bacterial imbalance. Too much white coating on the tongue is also a sign of dehydration. No coating on the tongue may also indicate dehydration and bad breath. As a solution, I began to use a tongue scraper and modified my diet to restore healthy gut flora. Bad breath is a warning sign of gum disease or tooth decay that can be caused from poor dental hygiene. Other underlying causes of bad breath include an undetected mouth infection, such as tonsillitis or sinusitis. Bad breath may also result from environmental or food allergies, poor diet, constipation, decaying mercury filings, sleep apnea, diabetes, kidney disease, acute rheumatic fever, measles, tuberculosis, pneumonia, gastritis, bronchitis, acid reflux, dysentery, liver cirrhosis, liver failure, and cancer of the mouth, throat, or nasal passages. Smoking can also lead to dental problems and bad breath. Foods containing sulfur, like onions or garlic, can also produce short-term bad breath. Chlorophyll is Mother Nature’s mouthwash! You can find chlorophyll in parsley, spirulina, chlorella, and alfalfa, and it helps to neutralize bad breath. Chlorophyll also helps to eliminate toxins from the body, and bad breath is a common sign of a toxic colon and digestive system. 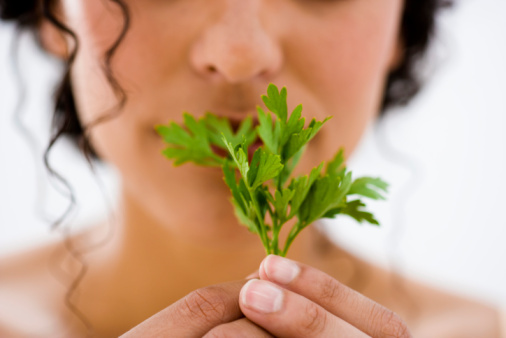 Liquid chlorophyll or liquid parsley extract can be taken after meals to freshen the breath. Other vegetables high in chlorophyll include spinach, garden cress, leeks, arugula, endive, cabbage, kale, and broccoli. Zinc deficiency is common in people with bad breath. Taking zinc supplementation and zinc-containing mouthwashes or toothpastes can help fight bad breath, neutralize volatile sulfur compounds, and promote a bacteria-free mouth. In a 2008 study published in the Journal of Clinical Dentistry, researchers discovered that toothpaste with zinc improved bad breath better than toothpaste without zinc. Try to include more zinc-rich foods in the diet, such as pumpkin seeds, sesame seeds, zucchini, asparagus, and collard greens. Your daily probiotic supplement can also help fight bad breath. According to a 2011 study published in the journal Current Opinion in Gastroenterology, the good bacteria found in probiotics can help prevent the buildup of bad bacteria that cause bad breath. Probiotics can also improve other contributors to bad breath, such as poor digestive function, constipation, and candida. Also, it is a good idea to add fermented foods into your diet that contain natural probiotics, such as kimchi, kefir, sauerkraut, or kombucha. Cooled peppermint and rosemary tea can also be combined for an effective herbal mouthwash. Other effective herbs for bad breath include milk thistle, tea tree, stinging nettle, dill, licorice, dandelion, fennel, goldenseal, wild yam, lemon, myrrh, clove, pine needle, and eucalyptus, and sage. Apple cider vinegar, for example, is a traditional folk remedy for bad breath. Take two tablespoons of apple cider vinegar before each meal. You can mix the vinegar in a glass of water if you like. Apple cider vinegar could help your digestive system. Baking soda is considered a great way to keep bacteria in check in your mouth. Put some on a toothbrush and clean your teeth and tongue. Baking soda is alkaline and could help to reduce the acidity in your mouth. The more acidic the conditions in your mouth, the more likely harmful bacteria will thrive. You could clean out your sinuses and clear up infection by gargling with salt and water. A salt and water mixture could help to eliminate bacteria around the tonsil area and the back of the throat. Gargling with this simple solution could also help to rid your mouth of mucus and food particles that can feed chronic, low-grade infections. Anise seed is another folk remedy that has been used for centuries to freshen breath. Anise seed has a distinctive licorice flavor. It is believed to have a natural ability to kill the bacteria that causes odor. Cardamom, dill, or fennel seeds are all believed to have similar abilities to control or mask bad breath. There are a few homeopathic remedies that help fight bad breath. Mercurius solubilis is considered a top remedy for offensive breath, especially when the cause is tooth decay. Mercurius solubilis is a good remedy for someone who has a yellow, thick coating on the tongue, or a person who experiences excessive salivation. Nux vomica is a good remedy for the person who has bad breath and a history of heartburn or constipation. Pulsatilla can help treat bad breath that is caused by eating too many fatty foods. What are other ways to fight bad breath? 1. The bad breath solution for dehydration is to drink more water. It is a good idea to drink a glass of filtered water every two hours to help with digestion and eliminate toxins. 2. Dental hygiene is important to fight bad breath. Be sure to brush your teeth and floss at least twice a day, preferably after meals. Also, scrape your tongue with a metal or copper tongue scrapper. 3. Other natural remedies to treat bad breath include digestive enzymes, vitamin C, coenzyme Q10 (CoQ10), and the natural sweetener xylitol. 4. It is a good idea to fight bad breath with a diet heavy in fruits and vegetables to help ensure proper hydration. Consume natural foods that contain nutrients that are important for dental health, like vitamins A and C.
5. It is also best to avoid foods that can hamper the digestive system, such as fried foods, processed foods, and mucus-forming foods like dairy or refined flours. 6. Vitamin deficiencies, especially vitamin C and niacin, are the cause of some gum diseases and tooth decay, so make sure you are getting enough of these vitamins through your diet. Keep an eye on your vitamin B6 levels, too. Vitamin B6 is necessary for oral health. Many people are deficient in B6 without realizing it. When it comes to dental health, make sure you go for regular check-ups. A dental hygienist can remove plaque before it builds up a layer of tartar that can harbor bacteria. Balch, J., et al., Prescription for Natural Cures: A Self-Care Guide for Treating Health Problems with Natural Remedies Including Diet, Nutrition, Supplements, and Other Holistic Methods (Hoboken: John Wiley & Sons, Inc., 2004), 82-85. Navada, R., et al., “Oral malodor reduction from a zinc-containing toothpaste,” The Journal of Clinical Dentistry 2008; 19(2): 69-73. Hur, M.H., et al., “Reduction of mouth malodour and volatile Sulphur compounds in intensive care patients using an essential oil mouthwash,” Phytotherapy Research 2007; 21(7): 641-643. Katz, H., “Bad Breath? How Probiotics Can Help,” Huffington Post web site, June 15, 2011; http://www.huffingtonpost.com/dr-harold-katz/bad-breath-probiotics_b_857506.html. “What is bad breath? What is halitosis? What causes bad breath?” Medical News Today web site, October 7, 2009; http://www.medicalnewstoday.com/articles/166636.php. “What causes bad breath?” Washtenaw District Dental Society web site; http://www.washtenawdentalsociety.org/library/25/BadBreath%28halitosis%29.html, last accessed June 30, 2015.